Please have a look at Klim’s sizing chart below to choose a size. We measured a sampling of sizes in this pant and found the waist to measure out just slightly larger than the chart.. about 1” larger at the most (which is common in pants). The measured inseam lengths matched the chart very well. We took some photos with the size 12 pant on our Fit Check mannequin Shirley so you can take a see what that looks like. Shirley is a standard dress size 12 with a 32” waist and 39” hip. Today I’m looking at the Artemis Pants for women and also the Altitude Pants for women. 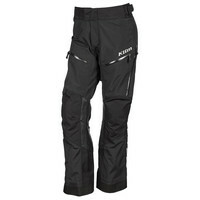 Both styles are a Gore-Tex shell with pockets, venting and both are equipped with D3O armor in the hips and knees. In looking over these two styles from Klim I don’t see a substantive difference in function, so I’m going to tell you about both. The two styles have slight styling differences and if you planned to pair the pants with their respective matching jackets, you’d have a good reason to choose one over the other, but otherwise, you could choose based on graphic style and color which are slightly different. These pants are a solid textile shell that is waterproofed with the best… Gore-Tex, and are guaranteed to keep you dry. The type of shell material is a a textile material bonded directly to the Gore-Tex waterproofing material. There really isn’t a better system to provide waterproofing and still have breathability. They do have some large zip vents on the side of each thigh and exhaust vents on the back of each thigh. These close with waterproof zippers, and when open, will admit air directly through the pant, which should give some comfort in warm weather. Klim doesn’t include under-layers with their basic gear, but rather they encourage you to use your own layering depending upon the weather. The pant leg design here is inspired by dual sport or adventure riding… the leg opening is large at the bottom to accommodate just about any boot but the cuff has snaps so you can make the pant leg smaller at the end if you like (for smaller touring/street boots). The inside area of the leg near the knee is leather. The leather works to help prevent melting from hot pipes and also give some “grip” for those wrangling a bike off the road. This is a common feature in off road and adventure riding pants. The pants come with a full set of D3O armor in the hips and knees. The knee armor installation is great…. the armor is inside a pocket that is quite a bit larger than the armor, and inside the pockets there are strips of Velcro so that you can position the armor higher or lower in the pocket, so that it hits in the right spot when you are mounted. This is a nice feature to accommodate varying heights of riders. Klim says: The all-new Altitude Pant proudly showcases the fit designed specifically for a women with the proper armor technology for a perfect match. Featuring the latest D3O® EVO technology, forward-thinking armor (also designed specifically for the aggressive female rider), GORE-TEX® GUARANTEED TO KEEP YOU DRY® fabrics, intelligent stretch panel engineering and increased use of 3M Scotchlite reflective.